Whether you’re on a romantic holiday or simply treating a loved one to a relaxing gift, a couples massage is the perfect way to pamper and rejuvenate. Despite its suggestive name, a couples massage isn’t limited to romantic partners, this treatment can be enjoyed by friends and family members wanting to share the experience of rejuvenation. A couples massage can benefit all relationships. These sessions promote closeness in a soothing environment. The clients can use this time to catch up, communicate feelings, or simply relax while being pampered. Each individual will receive a 60 minute unique massage tailored to their needs. Hot towels and hot stones are included. 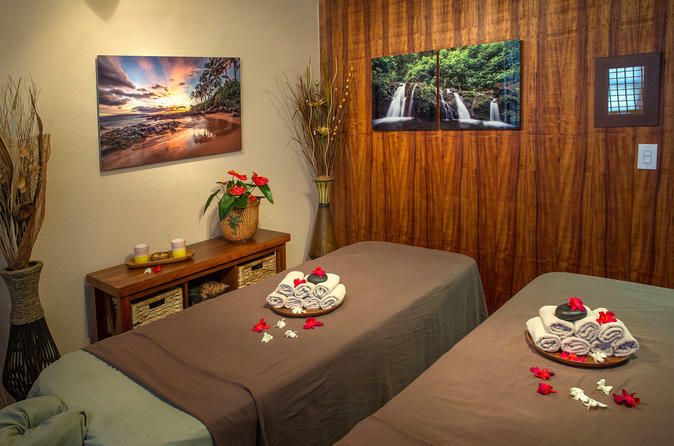 All of the packages at Hawaii Natural Therapy can be booked as a couples treatment. Massage is known to reduce stress, sore muscles, tension, pain and stiffness while improving circulation, boost immune system, and contribute to overall good health. These sessions allow both individual needs to be treated while sharing a transformative space. Couples who strive for s healthy lifestyle can enjoy the benefits of massage together.